I became such a convert to night-time masks and treatments last year and now these kind of products hold a permanent position in my nightime skincare routine. 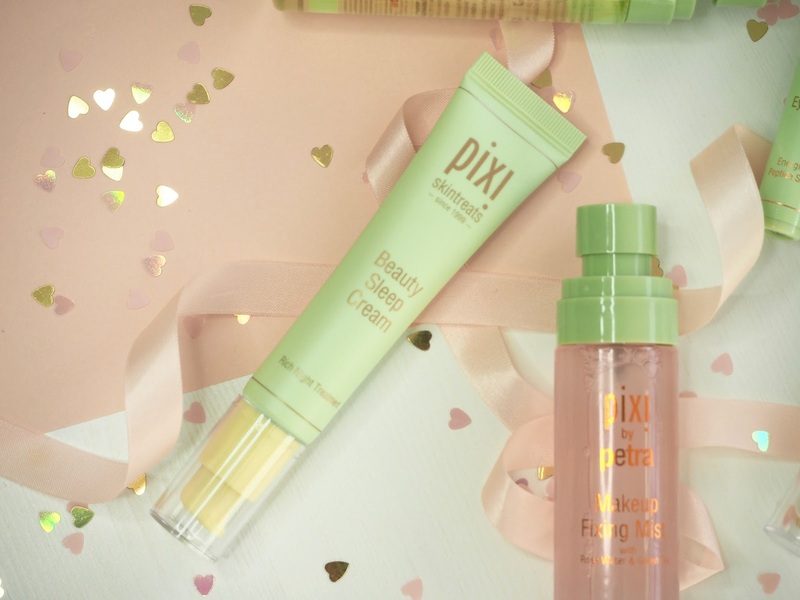 The Pixi Beauty sleep cream has a light consistency which is easily absorbed into the skin, and I find two pumps of the product is just right for my whole face to hydrate while I sleep. This one smells subtly of lavender, so I enjoy applying this just before bedtime as it helps relax me ready for sleep. Whilst I've got a night time eye cream I love, I've been needing to add something for the mornings to my routine. The 24k eye elixir is packed with collagen and peptides and tackles both anti-ageing and puffiness all in one as it comes in a cooling rollerball form. I've been getting on so well with this and it really makes a difference to the appearance of the bags under my eyes! At first I wasn't sure any product was coming out when I used the rollerball, but actually it releases just a tiny amount of product as you roll, which is all you need and stops you from wasting the product. 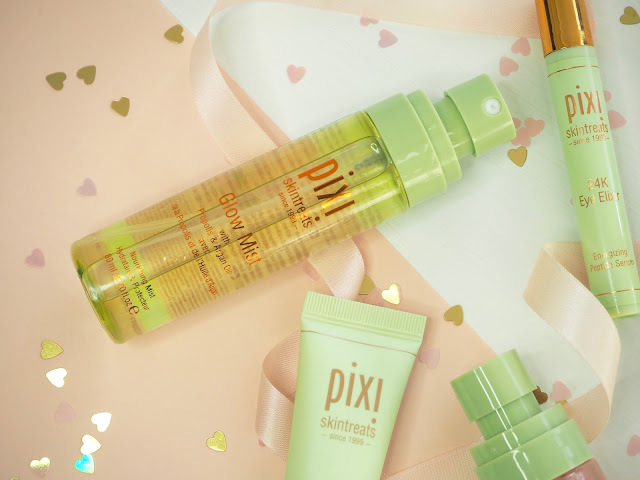 Probably the most glow giving of all of the products I'm mentioning here, if you have really dull, dry skin, this is the one to go for. 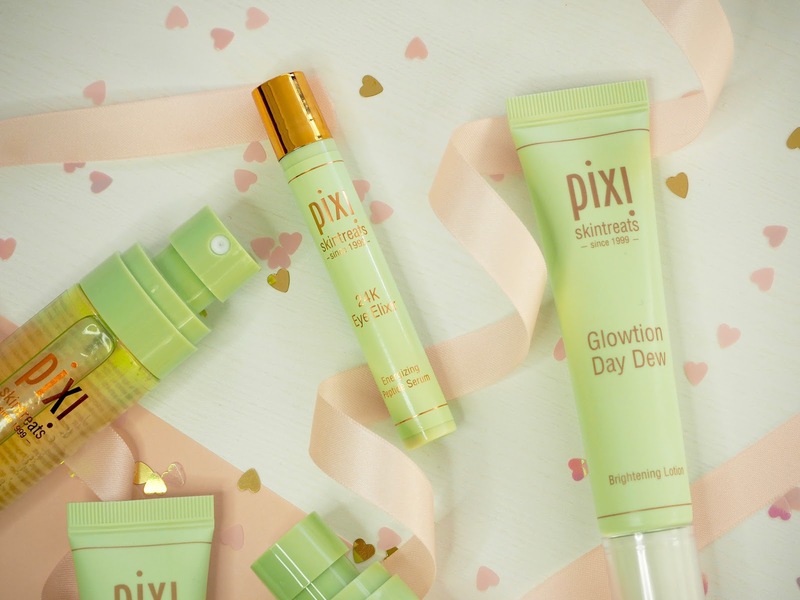 It's a moisturiser that leaves the skin instantly more radiant and glowing so it makes a perfect base for makeup. As much as I have dry skin and dullness, my skin is combination and I have oily patches, so sadly this doesn't work for me over the whole face. When I apply this avoiding my t-zone, I get a much better result just where I need it. You need to shake this mist to mix the oils with the other ingredients which make up this glow giving skin booster. You can use this to refresh the skin any time, as well as before and after makeup for a dewy finish. As with the Day Dew, I do have to use this sparingly as with me glow can quickly turn to shine and oiliness which are not so flattering! I really rather like spritzing this one before I apply my foundation to make everything blend much more easily and to give that very subtle lit from within glow. From a mist I've been using before my makeup and onto one that I've been using after. 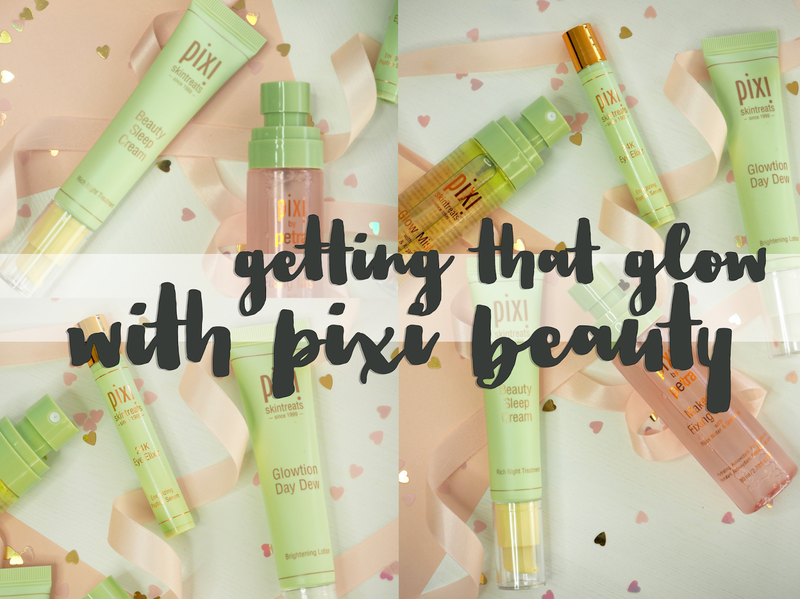 The Pixi makeup fixing mist first caught my eye after I saw someone refer to it as 'super glue for your face' - well I had to try that out now didn't I?! Despite that bold claim setting my expectations really high from the start, I've been really impressed with this setting spray and have noticed a big difference in how long my makeup lasts. The one thing I've struggled with is achieving the perfect spray as you need to hold this one a bit further away from your face that most in order to get the fine mist coverage I'm after. Other than that, I'm in love with this! 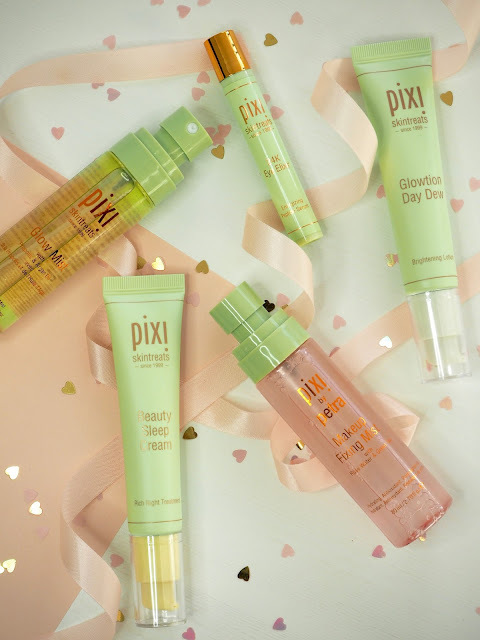 A Pixi skincare post is of course not complete without a mention of the cult Glow Tonic! I was recently very lucky to receive this syper-sized glow tonic with my name on it. This is the biggest Glow Tonic yet and it's a huge 500ml size with a pump. I've put this one next to my bed and I have my regular sized bottle on my dressing table so now I won't forget to use it day or night! If you don't know (where have you been???) 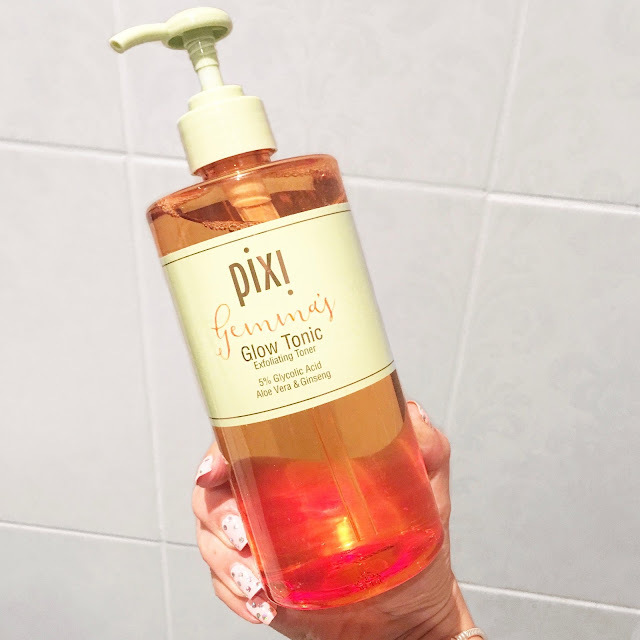 Glow Tonic is a toner containing glycolic acid to help chemically exfoliate the skin for a brighter, more even and glowing complexion. 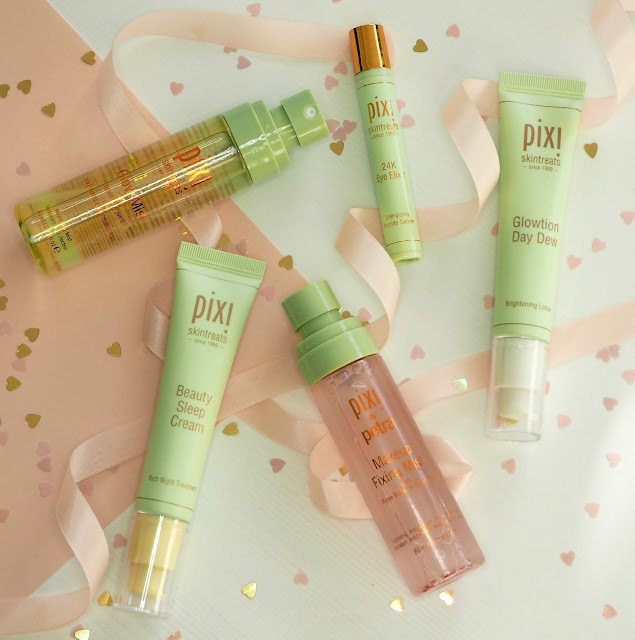 Have you tried any Pixi skincare?